Sweet as can be! Yummy pink frosting dotted with bead sprinkles and a little cherry on top. 100% natural wool. 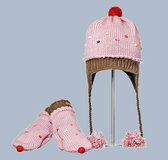 Pair with our cupcake hat and voila a wonderful sweet dessert.